Whether or not we like it, we are increasingly people of the moment—or even the micro-moment. We hear about a book and want to order it right then. We see a plant and want to identify it, or spot those fabulous boots and want to buy them. What does this mean for marketers? You already know that mobile use is sky-rocketing. But it also means that your digital presence is vital. How you look and feel in the first seconds of a customer interaction determines if they’ll stay or go. Good writing, good design and having a mobile-friendly site isn’t optional any more. It’s imperative. If your company is already there, hooray. But if they’re not, learn to create the moments your clients crave—and see what happens. Creative work developed by CMBell Company and clients has received eight awards from the 32nd Annual Healthcare Marketing Advertising Awards competition. Gold awards were given for Littleton Adventist Hospital’s 25-year anniversary video and elevator wraps. A gold award went to Dignity Health’s Recruiting Display. A bronze and merit award went to Adventist Health Southern California Region strategic planning video. Three merit awards went to Simi Valley Hospital for their 50-year anniversary print ads, transit shelter posters and elevator wraps. We celebrate the hard work of our clients and our team in bringing together these creative projects. Titillating, not educating. Getting the customer’s attention doesn’t necessarily mean it will lead to anything useful for either of you. Making zombies, not superheroes. Move from brainwashing (which doesn’t work) to helping them. Infecting, not connecting. Going viral may make us temporarily giddy, but relationships are really the goal. Communicating, not elevating. Create value in your communication, rather than merely contributing to the noise. Stay tuned for more in our series on Marketing Madness. This mobile app for a national association was designed to reach policy makers and was paired with a video to deliver facts that refute common misconceptions about private colleges and universities. A mobile app is a good way to keep important information in the hands of your customers, as it can be deployed and updated quickly. Sent via an email link, an e-card is a popular and affordable way to connect with your customers in a fresh way. The National Association of Independent Colleges and Universities put a fresh spin on their annual meetings invitation by commissioning this motion graphic—which was posted on their website and distributed via an email link. This revolutionary new business used a point-of-purchase electronic display to deliver brand messages. This hospital banner ad targeted specific customers and paired a holiday message with a subtle message of health—and linked viewers to their website. 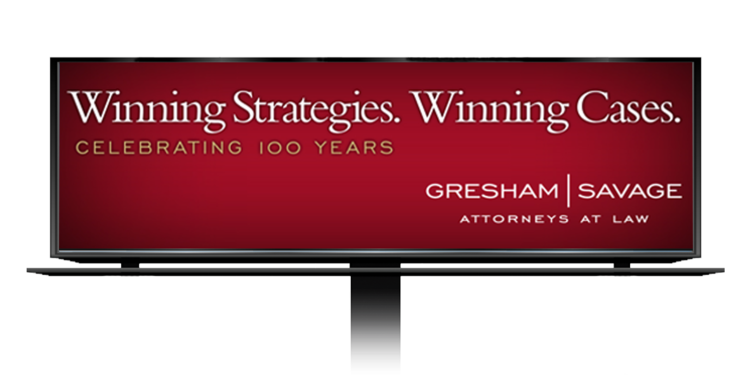 This electronic outdoor board placed on well-travelled Los Angeles corridors increased awareness for this regional law firm. Is your mission statement forgettable? It needn't be. There’s no room for health care-speak in this short Centennial motion graphic video we developed for White Memorial Medical Center in Los Angeles. Illustrated with vibrant custom and stock images, it speaks to the deeply personal side of health care—and the story of how a community and a hospital partner to create a better future. As the “kick-off” piece for the Centennial celebration, it sets the stage for their deeper story to be told throughout the year. Use beautiful, memorable and fresh language. If it could sound like the mission statement of any competitor, it’s time for an update. Bring it to life via video. A mission statement is an organizational compass that serves as a constant reference point. Because words shape behavior, make sure your mission statement is living up to its potential. You can see the rest of the video package here. The use of 2D barcodes (which come in varieties like QR Codes or Microsoft Tags) continues to escalate because of the immediacy possibilities they present. Put simply, 2D barcodes let people respond to a call to action at the time they are interested—when they’re more likely to respond. Most of us won’t respond to a call to action if there’s a delay between the impulse and access to your computer. But mobile closes that gap, making now the perfect time to respond. They can lead to contact entries, calendar items, video, apps, directions, coupons, menus, links to reviews, virtual tours—you name it. But make no mistake—users expect valuable content, entertainment value, or time or money savings (like downloading a coupon, or contact information). Linking to a Web page is the old way—linking to content devised for mobile is the new way. They can be customized visually. Test, test, test before you launch. 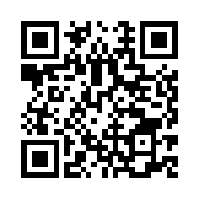 Be wary now of malicious QR codes with malware. Criminals can replace the QR code on your Web site or even put a sticker onto existing marketing material, reports PC World. Don’t overlook the possibilities of using barcodes in your advertising campaign. The possibilities are both endless and promising. This week the entrepreneurial Wilkinson Baking Company launched the in-store testing phase of the world's first fully automated commercial Bread Bakery—a technology that mixes and bakes fresh, healthy bread from start to finish without any human involvement. We worked with them to develop a series of electronic billboards (see below)—among other promotional elements—that deliver in-store key messages. This one-of-a-kind technology has been in development for nearly four decades—and introduces a completely new way of thinking about bread. 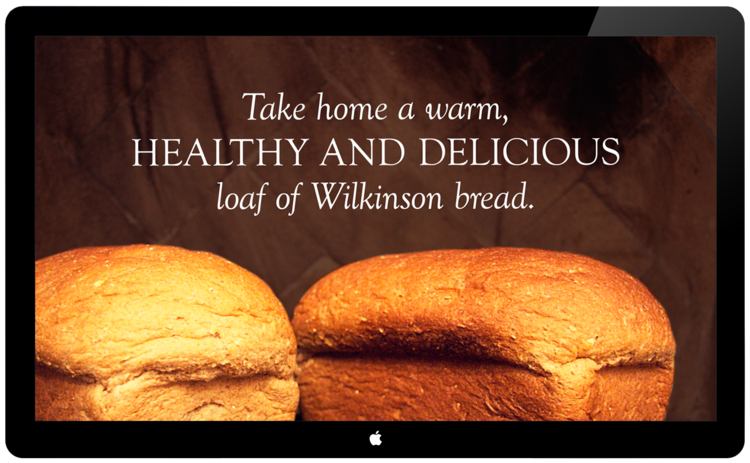 Using only the purest and best natural ingredients, Wilkinson bread is more affordable than other premium brands and has a smaller carbon footprint than national brands. They never sell any loaf older than 24-hours—and natural enzymes keep it fresh for at least seven days. Taking inspiration from the creator of Tom’s shoes, WBC took the bread concept one step further and has committed a portion of every loaf’s sale to drilling and maintaining wells in Africa. Each loaf provides 77 cups of fresh, pure water to people whose only source of water is often filthy and several hours’ walk by foot. This is a company to watch, so if you’re in eastern Washington, stop by Super 1 and follow your nose. 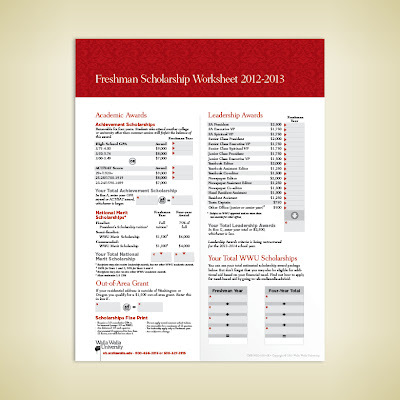 Walla Walla University’s new scholarship program gives students instant feedback on what they’re eligible for—and has proven to be an important part of their marketing successes. When they asked us to develop a simple piece to communicate this complicated message—we recommended an interactive visual piece that is available in print and on-line (click here to view the online version). Very often, a visual is the best way to convey complex information quickly. Publish status updates or major stories in the morning. If you publish between 11 am and 4 pm your content may go unnoticed due to the heavy traffic by other users. Tag your friends when you post a note, so they see a message on their wall and are more likely to read it. Unfortunately you can only tag 30 people at a time. If you post multiple notes in order to tag more than 30 people, make sure to delete the duplicated posts in your news feed so you don't look like a spammer. Encourage interaction from your fans. 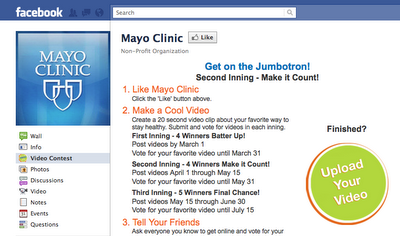 Invite conversation, create contests, post interesting status updates and encourage check-ins. Share interesting links and encourage people to comment, but be sure to post the whole link instead of a short link because it's 300 percent more likely to get clicked on. Thursday is the best day of the week to get the most visibility for a Facebook post. Facebook may be the best platform for making a video go viral due to its ease of embedding media. Remember AIDA—Attention, Interest, Desire, Action. Visit Ragan.com for more social media tips. Ed Bennet, author of the website Found in Cache: Social Media resources for health care professionals from Ed Bennet, advises health care organizations not to get into social media because you think you’re going to get more patients, but because you’re helping be responsive (not responsible) to people reaching out looking for answers. Washington's private colleges are a cause we love to support because of the way they change lives and help our state's citizens. About 40,000 students attend these ten schools—yet the schools receive less than 2% of the state higher education budget. This saves the state more than $330 million per year in operating subsidies—while increasing choice for those attending college. Contrary to what many think, these schools serve an economically diverse student body, providing quality education to students from all demographics and income backgrounds. We developed this animation for them to help them bring their story to life—and reinforce their key brand messages using a medium that works well on the Web and with social media. Using video in your marketing strategy is no longer a luxury—in many cases, it’s now considered an essential part of any messaging strategy. Once you’ve developed the video, make sure you’re maximizing your investment by taking advantage of the many free distribution methods. Company website. Increase traffic and interaction by including video on your Web page. Company lobbies. Many companies are using HD video screens in high traffic areas, making it an ideal place for key messages. Mobile. Mobile is the media of the future, so repurposing video with mobile in mind can be a great idea for the right message. Post on your company Facebook page. Share it with your circle of influence by posting it on other social media sites, like Linked In. Post on your company You Tube channel. If you don’t have one, now’s the time to set it up. Send an email link. Depending on the message, this can go to employees (remember, they’re a sales force too), stakeholders, donors, board members, volunteers and customers. Visitors to websites are now looking for video content first. Smart businesses can no longer ignore video as part of their marketing and communication strategy. A report on comscore.com states that 174 million US internet users watched online video content in March of 2011—for an average of 14.8 hours per viewer. The use of video often increases your marketing results. Here are some facts from slingshotseo.com. Video increases engagement, causing visitors to stay longer on your site—and making them more likely to buy. 65 percent of visitors will watch a video to completion—compared with only 10 percent who will read an entire website. 12 percent of users coming from a video are ready to buy—compared to only 1 percent for text-only users. You Tube is the second largest search engine next to Google, and last year alone You Tube reportedly exceeded 2 billion views per day Are you where people are looking for you? The demand for receiving content by video continues to explode, making it by necessity an important part of your marketing mix. Video can be used in many ways for communicating the same things as traditional media has been used for, but its ability to convey through images, sound and motion makes it higher impact. Communicate key messages. Putting a face to key company messages makes it more personal and memorable, and because it can be made available any time, any place, over time it allows you to reach a broader audience than live presentations can. Recognize top employees or volunteers. Nothing inspires like hearing the story of another person who is passionate about his or her work. This kind of message helps to build a culture of excellence—reinforcing behaviors that fulfill your company’s goals. Share news. When announcing a new product or service, video should be part of your roll-out campaign. Offer testimonials. Feature clients talking about your brand to bring added credibility to your message. Show—vs. tell. When you want to teach, use video. An ideal medium for orientation and training, it’s the next best thing to being there in person. Go viral. Not every video is a candidate for going viral, but one that has entertainment value is more likely to do so. More and more companies are couching subtle product messages in viral-style videos to promote this kind of distribution. Repurpose ads. By all means, make sure you’re posting TV ads—in addition to buying air time for them. It’s also possible to create a kinetic motion production (type animation) that restates a print ad—but adds the elements of sound and motion. Communicate internally. Video can capture the soul of an organization, and fuel its core mission. Once you’ve developed your video, make sure you’re maximizing your investment by taking advantage of every distribution method (many of which are free). We produced a series of mini-videos for St. Anthony North Hospital's 40-Year Anniversary campaign—all of which are posted on their website, their You Tube channel and their Facebook pages. Each of the personal interviews tells a piece of their story—what the hospital means to its community, its distinctive mission and its vision for the future. Quality videos are getting more cost-effective to produce. This, coupled with the the pervasive consumer appetite for video, should make it a part of any significant campaign. What are your reactions to this campaign? Do you think St. Anthony North's message was effectively communicated to the community? Leave us a comment and let us know what you think. We developed a promotional campaign for Dimensions Pain Management, a medical clinic in Colorado, and recommended the addition of kinetic typography to use in social media applications. We've not only found that the presence of an animation increases traffic on our own site, but in industries like health care and law, it's still fairly young and so is a way to get your message noticed. It provides a fresh way of conveying your message in a media that is versatile and can be used in many ways—from posting on one's site, YouTube and Facebook page to sending links via email. The addition of motion and sound amps up a message and delivers it in a way that keeps the viewer's interest. Kinetic typography and other animations can be simple, like this one, or far more complex. They can be used for anything from a new service launch to infusing your Web page with new life. We love working in this medium and think it holds a lot of promise for business—given the apparent appetite consumers have for productions like these. The challenge for those of us who create advertisements is rarely finding a good promise to make. More often, it’s deciding which one message will be the strongest—and having the discipline to trim out all the other good, but nevertheless diluting, messages. This ad shows how much more powerful a single, well-executed idea is than an ad that tries to say too much. By focusing on the “forty cents” concept, the message is unmistakably clear and memorable. Of course, more could be said. But they wisely resisted the urge to give added facts or details that compete with the main message. Sometimes it’s what you edit out that makes what is left work so well.